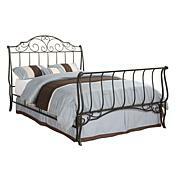 This full-sized metal sleigh bed is an elegant piece that complements many bedroom decors. This bed features detailing cast iron scroll work and a classic sleigh style. Avoid direct sunlight, alcohol, nail polish remover and paint thinner. Absolutely beautiful bed that came with out instructions to assemble it. Thank goodness it wasnt difficult to figure out. This bed was easy to assemble and put it in my guess room. The design look expensive and antique. Just the right color, it's beautiful, you would think I paid more for it. I love this bed, awesome. Really beautiful once you open the box and set it up.